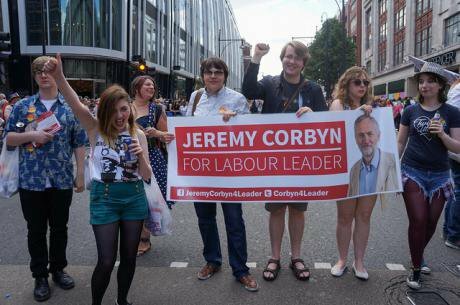 Jeremy Corbyn won a stunning victory to become leader of the Labour party. His triumph was clear protest against austerity and mainstream free market consensus on both the acceptable right and left. Promise is the possibility for a new progressive domestic agenda centred on economic equality, social investment and popular welfare. As one headline declared, “Jeremy Corbyn’s victory has already transformed politics”. The potential foreign policy consequences of this triumph, however, are less clear. Critics have charged Corbyn of being an extremist sympathiser and dangerously extremist himself. They point to his now infamous reference to Hamas and Hezbollah as “friends”. They claim his critiques of Israel are evidence of anti-Semitism. They even suggest he is unpatriotic for not singing the national anthem while in the Commons. These “fatal” charges are easily dismissed upon closer investigation. Corbyn referred to these groups as “friends” as a matter of diplomacy not ideology. His challenge to Israel is firmly on the grounds of social justice not religion. And whether or not he sings the national anthem pales in comparison to the lack of compassion Tories have shown toward their British countrymen with their economic austerity policies. Fundamentally, does he in fact offer a new positive vision of Britain in the world? Can Corbyn reverse conventional wisdom to show the extremism of the status quo and the existential need for global justice. Almost immediately following Corbyn’s election as Leader, the Conservatives went on the attack. More than just a political rival, they warned that he was a significant “national security threat”. These fears reflect a growing public debate regarding who and what actually represents modern “extremism”. The disastrous invasion of Iraq, Britain’s continued close relationship with “friendly dictators” and the country’s arm sales to dangerous regimes internationally challenge the mainstream’s credibility as protectors of national security. In the impassioned words of one citizen, “Jeremy Corbyn is a patriot – he would never have waged the illegal war that killed my son”. It remains to be seen if these conservative efforts – in both parties – will be successful. The early public ridicule they have received suggest otherwise. The initial failures of this well worn fear mongering is an opportunity to profoundly reframe British foreign policy and the accepted beliefs that underpin it. The prevailing appeals to militarism and nationalism can be shown themselves as existential threats to the country’s survival. In their place is the need for a new agenda based on international solidarity, shared development and global justice. The contemporary shift in public opinion regarding asylum for refugees point in this possible progressive direction. This change was also witnessed in the popular support for Greece against the market driven “troika” during the recent Eurozone crisis. These views speak to an alternative perspective of international relations. A growing number of scholars, commentators and policy makers challenge traditional realist assumptions connecting national security to a strong defense and nation state competition. Policies like the “war on terror” in fact “make us less safe, less free”. By contrast, they highlight how cooperative efforts to enhance economic security and political freedom worldwide can lessen global conflict (and the conditions that breed it) thus making all countries safer. Even the conservative Wall Street Journal recently intoned, “Economic growth is a national security issue”. Interestingly, this blending of idealism and realism echoes the conservative political discourse of the recent past. At the end of the 20th century, the fall of the Soviet Union and the end of the Cold War promised an “end of history” that would replace the threat of nuclear annihilation with a peaceful world composed of free markets and liberal democratic nations. In the post-9/11 reality of the new millennium, the claimed necessary militarism of the “war on terror” was coupled by the idealistic neo-conservative notion that peace could only be secured through the global spread of democracy. Then President George W. Bush exhibited an almost divine belief in such realist idealism, driving his aggressive military actions and posturing. Within the present context, Corbyn is similarly trying to successfully advocate for a foreign policy that combines realism and idealism but to significantly ends. One where the almost Orwellian like mantra of “war is peace” is exchanged for a hard nosed appeal to the necessity of a progressive global justice agenda. Interestingly, Corbyn attempts to do so appear to harken back to, at least implicitly, another Conservative tradition – one nation Toryism. This variant of British Conservatism prioritizes the ability to unite the country through its established “common sense” values of decency and pragmatism. Tellingly, and perhaps not surprisingly, Cameron sought to recapture this tradition for his own free market purposes of legitimizing austerity. “Look at what you've done today, you have come to shame your leaders into representing you and your values. Come together to shame your leaders into showing just an ounce of basic human decency." Unlike One Nation Toryism, however, Corbyn has much more expansive world view. Gone are the paternalism and the acceptance of social hierarchy. Instead, he promoted human rights promotion, economic investment, diplomacy and social justice as part of an international “common sense”. They are pragmatic means for making the world a better place and in doing so making Britain securer. Jeremy Corbyn is introducing a potentially new political perspective for British foreign policy – one world Labourism. The survival of the UK and the globe could very much depend on its success. In light of Britain’s past and present history of imperialism and exploitation, it is also the decent thing to do.